Hildesheim constantly struggles between being the smallest german major city or being the largest town of Germany. The way I see it, it is a suburb of Hanover. However, it houses it’s own university and the college I went to. That means there are lots of young students, who like to go out and party. You can’t compare the town to Berlin in any way, but there is something boiling deep down within. Sadly there are not more than three venues to steam it off. You can choose between cheesy pop and schlager music, hedonistic dark-techno and some very alternative events every now and then. But what it lacks is a quality techno event. Innāscor is not just meant to be a series of events. The events are called »opus« (1,2,3…) to point out it’s character. Music shouldn’t just be played, but build the tension with a dynamic arc of suspense throughout the night. There is no limitation on genres, but a distinctive sound, that can be conveyed in any way the performing artists and DJs wish to translate it. 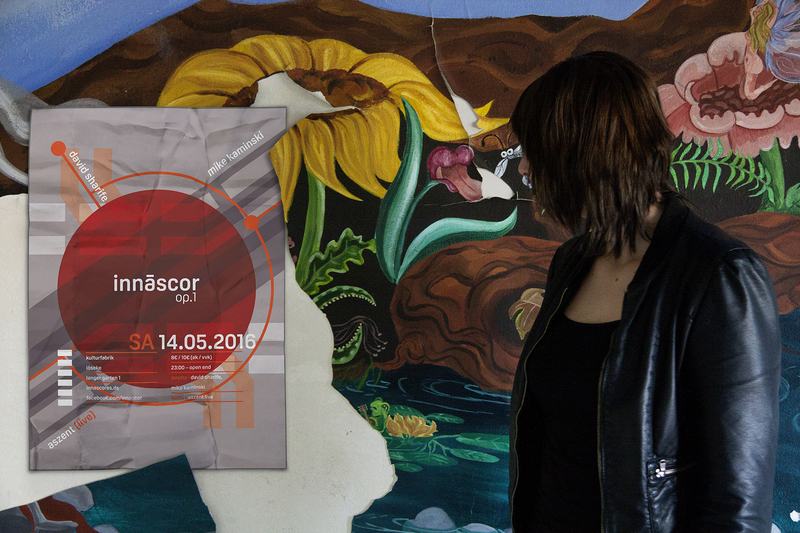 Furthermore innāscor functions as a brand for a netlabel, that distributes the works of the presented artists and in that way is also a transregional vehicle to advertise the events. 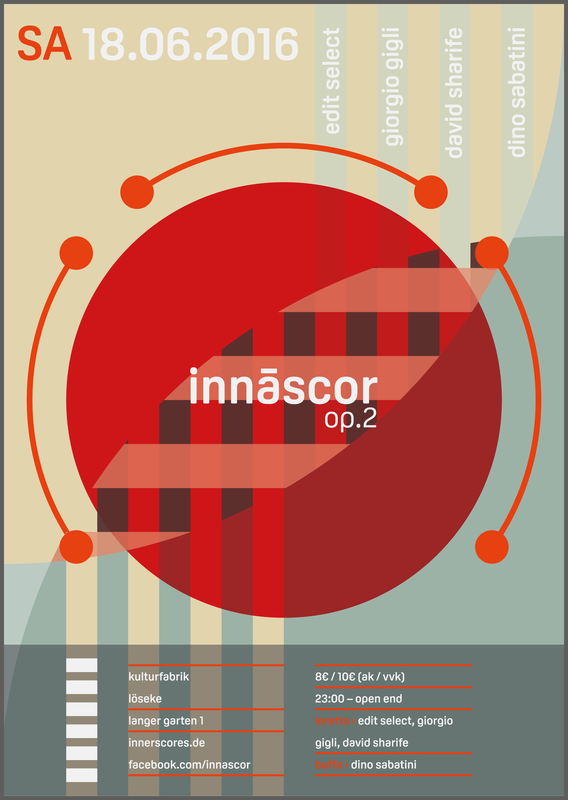 Last but not least, there is the innāscor association, that is responsible for managing the artists, the events, the releases and it organizes workshops (e.g., for music production, DJing, artistic workflows…). The main goals are to encourage and support young artists, and also to build a vivid community. Innāscor means »I grow (with)…«. And that’s what is supposed to happen – building a community that grows on itself. The name was intended to be exotic, as it should address an open minded audience. The visual language is inspired by classic swiss design, that behaves just like the music that innāscor represents: timeless and artistic with a futuristic touch. 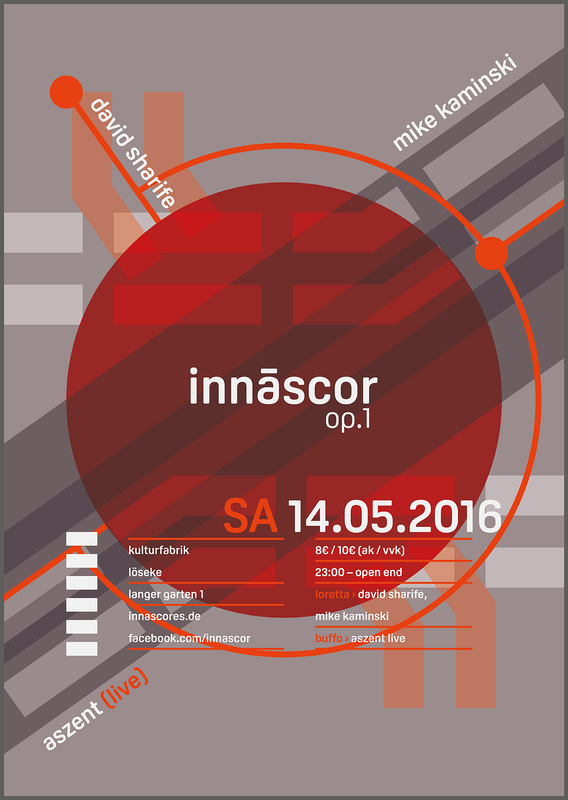 Poster for »innascor opus 1« underneath a peeling paint of a wall. 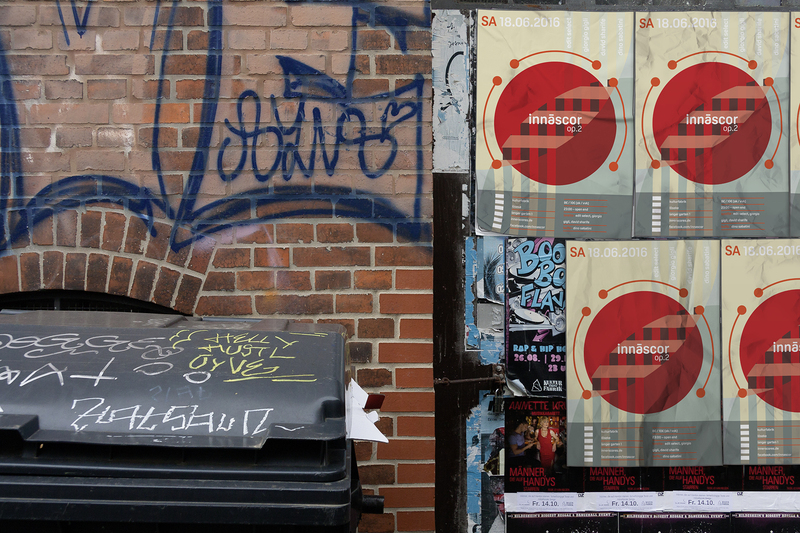 Poster for »innascor opus 2« on a congested wall in front of the venue.